I always feel that if nothing else, the eyes need to be clear and sharp in an image like this, which isn't quite achieved here - but it certainly does show how well they blend in with the prairie grass. 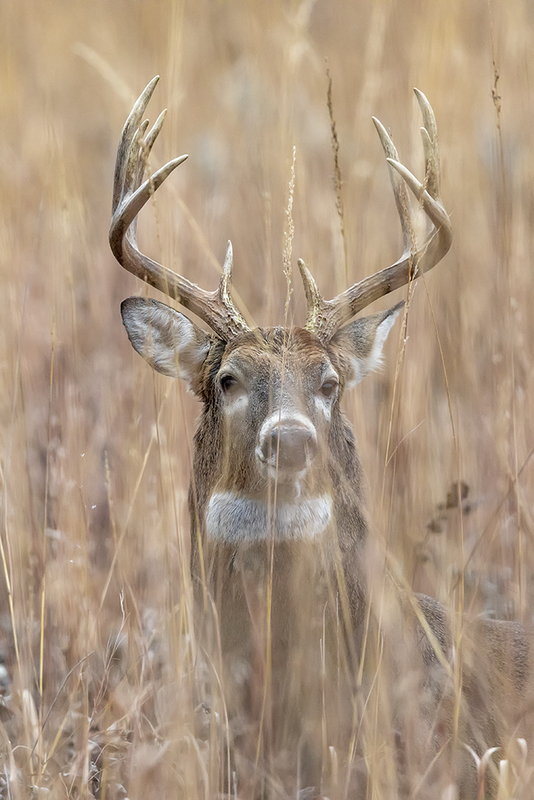 The grasses do make an interesting view- beautifully matched in color to the buck. I like the mood and how close you feel to the animal. Really quite lovely. Perhaps you could correct the deer's right eye? Doesn't bother me a lot, but Carol has a point about the eyes. I agree with Carol and Cindy. However, I really like what you have achieved in depicting the mystery of the hiding deer. I do feel as if I am only a few feet away. I like this a lot. You really managed the distance and DOF well to give just enough detail in the grasses to have a sense of vertical movement, but without competing with or overly obscuring the subject. It very much gives me a sense of being right there peeking at him in his hiding spot. The colors are soft and complementary, nice even light. It pays to have a vision and the patience to execute it well. Re the image, i'm sort of torn between Carol and Cindy. I'm a lover of trying to show something that is just not a portrait and something about it's life so lurking in the grass works... but,,.... it's presented as a portrait and I'm also a eyes sharp dude too, so I have conflicting thoughts. (I can quite happily show no eyes, but there are many ways to show behaviour).